Incretins are metabolic hormones which are used in the stimulation to decrease the sugar levels of blood. Incretins increase the level of insulin secretion after food intake released from the pancreatic beta cells. These hormones follow the islets of langerhan’s mechanism to regulate the blood glucose levels. Incretins reduce the nutrients absorption rate by gastric emptying in the blood-stream along with inhibition of glucagon released by alpha cells. Increatins help in regulating blood sugar levels for diabetes mellitus type-2 patients. There are two types of incretin peptides namely glucagon-like peptide-1 (GLP-1) and gastric inhibitory peptide which have low risk of hypoglycemia as well as impacts the patient’s body weight. Incretin impacts gene expression, and β-cell growth along with restricting glycogen secretion in the body. GLP-1 is a type of incretin hormone which effectively improves metabolism in patients with type-2 diabetes. Thus, incretin greatly improves glucose profiles, lowers free fatty acid levels, improves insulin resistance, lowers body weight and HbA1c levels and improves β-cell performance which is expected to highly propel the incretin based drugs market over the forecast period. Incretin based drugs market is anticipated to record a CAGR of 3.4% over the forecast period. Incretin based drugs market is expected to reach the value of USD 5.7 Billion at the end of the forecast period. The many advantageous properties of incretin based drugs are exploited in the field of healthcare for new usage discoveries which is expected to drive the incretin based drugs market rapidly. Currently the global incretin based drugs market is observing vibrant growth owing to increasing demand of diabetes control drugs in the market. Advances in pharmaceutical industry in the past few years and growing biologic hormonal explorations are projected to drive incretin based drugs market besides the wide range of functions of incretin based drugs in an immense range of body functioning such as lowering free fatty acid levels, improving insulin resistance, lowering body weight and more during the forecast period. On the basis of regional platform, global Incretin Based Drugs market is segmented into five major regions including North America, Europe, Asia Pacific, Latin America and Middle East & Africa region. As a healthcare based developed region, North America is panned to observe substantial growth in incretin based drugs market on account of rising incretin based drugs usage among the increasing diabetic 2 type suffering population. North America is estimated to be followed by Asia Pacific in terms of consumption due to expanding incretin based drugs requirements on the back of increasing geriatric population. On account of multiplying incretin based drugs uses in growing end-use population due to rise in adoption of sedentary lifestyle and rising number of cardiovascular failures, Asia Pacific is budding as a regional incretin based drugs consumption market. World Diabetes Foundation has estimated that, there will be 438 million people with diabetes by 2030 which infers requirement for insulin management market will attend escalating diabetes population. Incretin based drugs displays a promising market growth on account of high worldwide existence and occurrence of type 2 diabetes, wide-range research and development in technology for efficient insulin regulation and support from government and health care centers in making insulin management drugs available all over the world. According to World Health Organization (WHO) since 1980, the worldwide occurrence of diabetes in adult population has increased from 4.7% to 8.5% in the present year. 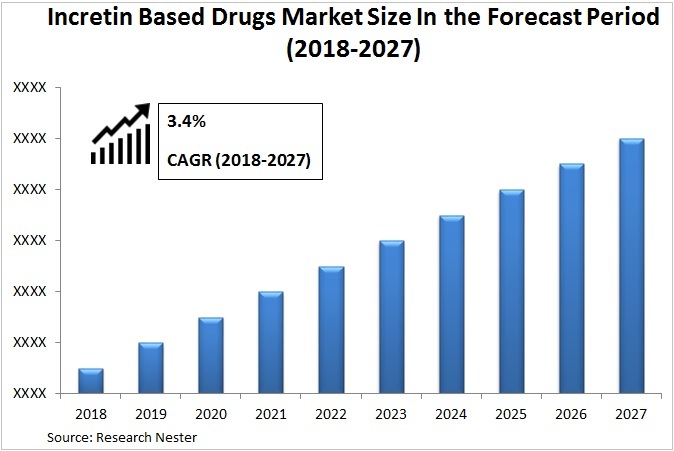 Moreover, increasing incidences of cardiovascular diseases, increasing geriatric population and high incidences of obesity due to adoption of sedentary lifestyle is anticipated to contribute significantly in driving the market of incretin based drugs over the forecast period. Furthermore, increase in healthcare expenditure and rise in per capita income of the present population is expected to propel the incretin based drugs market strongly across the globe. However, absence of insulin management in type 2 diabetes drugs from the market across the under-developed regions of the world along with concerns regarding efficacy of drugs, can impede incretin based drugs market growth while its obtainability would upsurge market size and demand in low and middle income countries.